Check out my latest cabinet build! 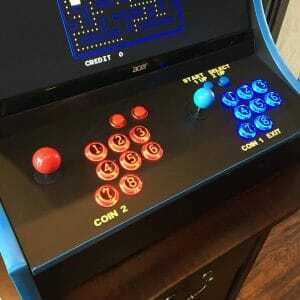 I just finished last week, a retropie bartop arcade cabinet! This unit, instead of PC based, is Raspberry Pi based! And I have to tell you, I am thrilled with Retropie! Those guys have done an amazing job. Anyway, I put this in one of our conference rooms at the office to let our associates use. They're pretty happy! Built my first arcade August 2015! Re: Check out my latest cabinet build! Great craftsmanship. Thanks for sharing the link with us too Mike. Members will find it useful for sure. Thanks! I'm working on a set of videos for the Raspberry Pi / Retropie setup. 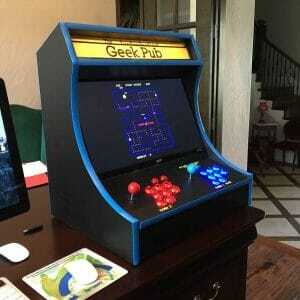 OK guys, I think I am going to do another Bartop Arcade. If you could change anything about this one what would it be? Would you make it smaller? Shorter? Single player? Mike, perhaps a Trackball? A bezel might look pretty cool too! You should raffle one of these off your channel. I buy a few tickets for a chance at that last one. You're not the first person to suggest raffling one off. I am not sure how the law works on raffles. I'd simply make one to GIVE away, but I am not willing to pay shipping on the thing. Another channel did a similar giveaway and made it clear that the winner had to pay shipping. He called the top 10 winners and all of them declined to pay. I don't want to get in that situation. I'm all up for ideas though, so shoot! How about just the flat pack? Many folks out there do not have a work space and for them the biggest challenge is just cutting the wood out. It would be easier to ship too. If it were me, I would state US shipping only. As for the raffle, yeah state laws very on that one.